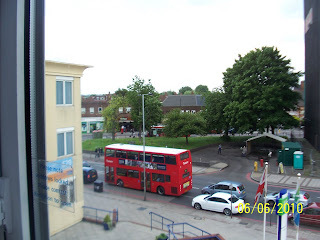 We arrived in London on June 4 (Thursday) , and checked into our authentic London hotel, The Holiday Inn Express. 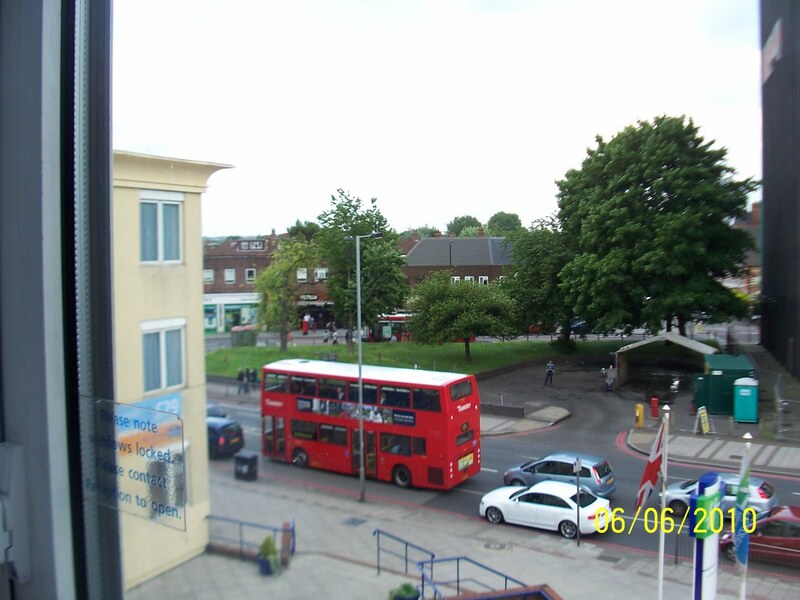 This view is looking out of our window to a double decker bus. It was a unique thing at that time. 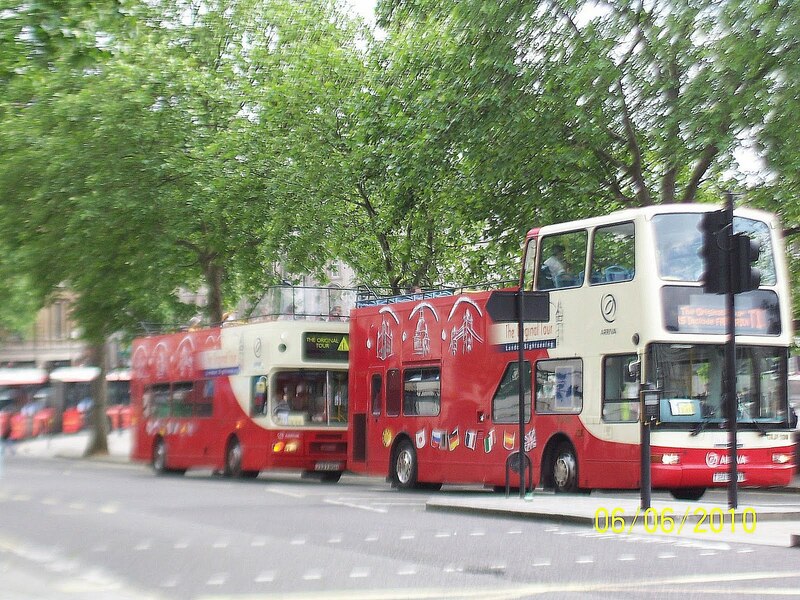 Soon double deckers were everywhere and not so unique. We made the mistake of ignoring all the warnings about "jet lag"; and, went to the Globe Theater on our first day in London. We had arrived some time before noon, took a nap (mistake) and went to the Globe Theater sleepy, sleepy, sleepy. The Globe was restored by Sam Wanamaker (American filmmaker?) and was a great experience, except for us nearly falling off our seats from lack of sleep (no backs). 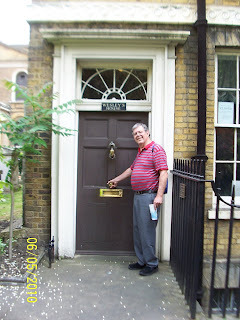 @on Friday we went to Wesley's Chapel, said to be the mother church of Methodism. The chapel is a functioning church, and a wedding rehearsal as going on, so we did not get down into the sanctuary. 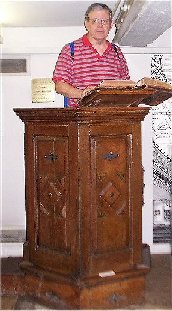 However, I did get to stand in a pulpit, said to have been used by John Wesley. Across the street from the Chapel was a cemetery where Susanna Wesley was buried; however we could not find her grave, as there was no map to the gravesites. 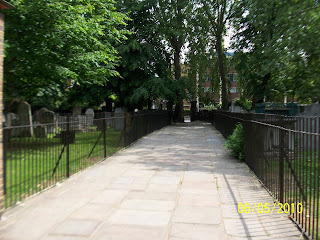 We did find graves for William Blake and John Bunyan. have a cup of tea together. Below is a picture of his grave, which is behind the Chapel. 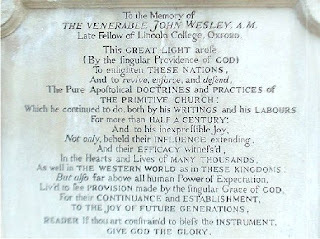 And a close-up of the memorial statement on his grave. 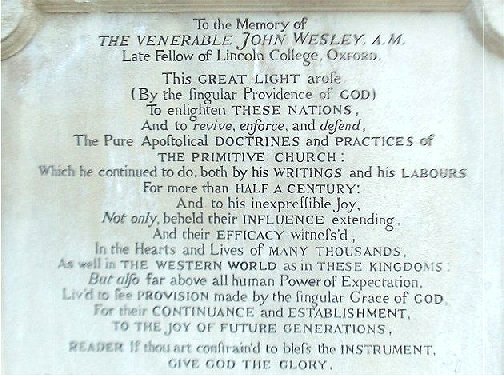 The Wesley Chapel had the atmosphere of a cherished museum, and the guide who led us around was rather formal and structured. He did not really want to hear anything I had to say about Wesley. We went back to the hotel, got some fish and chips from a neighborhood vendor. Long John Silver can beat this. But, the next day I found a Burger King a block from the hotel. The next day, we got smart and took a tour bus of London, where we saw more things than I can remember. I do remember circling Trafalgar Square the guide pointing to the Admiral Lord Nelson's statue. 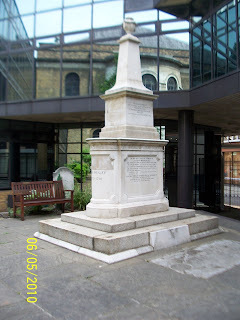 As we came around to the other side of the circle, he pointed out a view of the Rear Admiral Lord Nelson. We did get to Buckingham Palace, but alas did not have our camera. We say the changing of the guard, but, no offense meant to the Brits, I was more impressed with the same ceremony done at the tomb of the unknown soldier, in Washington D.C.
We did see the Texas Embassy Bar as the bus whizzed around a corner; but, I couldn't find it again on a bet. We are worms, but I do believe I am a glow worm." Then on to the Methodist Center for a great salad lunch Hit the spot. 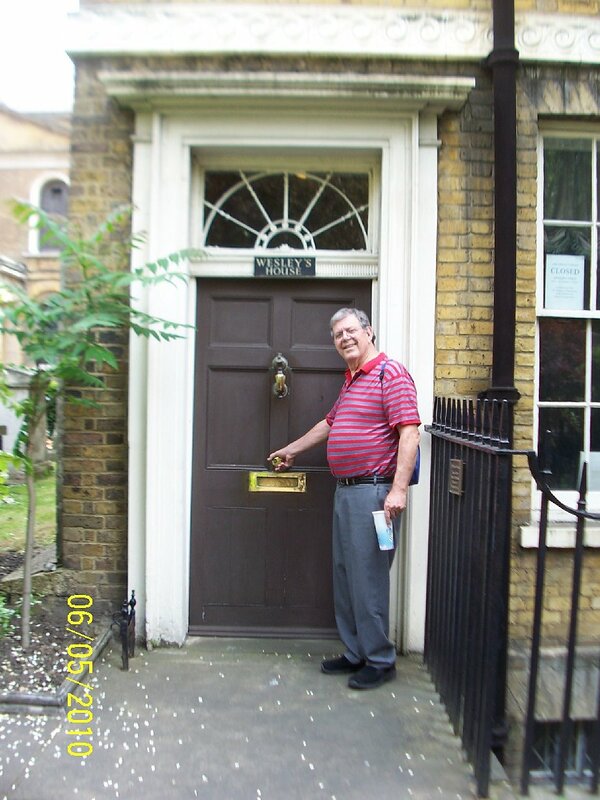 Next to the National Gallery where we saw all the famous artists that we learned about in art history. I decided I am more of. An audio responder than a visual,. Took a snazzy double decker bus to Oxford (it had wifi) Took a city bus to our Bed and B'fast. walking down the street I noticed the men's shoes are about two inches longer than their feet. Look like " elf" shoes to me. we walked about six blocks further than we should have . They don't have a very good system of marking their streets. This evening we walked around Oxford, discovered how the bus runs, ate supper at a Mexican cafe & tomorrow go up to Blenheim Palace (ancesteral home of Winston Churchill).